Wills which document how your belongings and property will be distributed after you die. Enduring Power of Attorney (EPA) in the Northern Territory documents who has been appointed to look after your financial and property affairs. You must register an EPA if you want the person you appoint to be able to handle real estate that you own. The EPA can be registered by the ‘donee’ after you have lost testamentary capacity. The Appointment of someone to specifically look after dealing with Centrelink and the Department of Health and Ageing. You may also find the Centrelink fact sheet on authorising a nominee helpful. The Adult Guardianship Act allows Adult Guardianship Orders which appoints someone else to be your legal decision maker if you have lost the ability to make “reasonable and informed decisions relevant to daily living”. The Act covers the areas of accommodation, health care, day to day care, legal matters, rehabilitation or training and financial matters. In the Northern Territory, this is currently the only way for legal decisions to be made for people with dementia who no longer have capacity that fall outside the coverage of an Enduring Power of Attorney. End of Life Directives (EOL) document you preferred medical treatment in limited circumstances. For instance, you can use a directive to refuse artificial respiration (or ‘life support’) if you have lung cancer or another terminal illness. Speak to your doctor about making a directive. End of life directives are enabled by the Natural Death Act. The ACT and Regulations are available on the NT Government website. There is limited information about forward planning for people in the Northern Territory. The Land Titles Office has some information about Enduring Powers of Attorney and how to create them. Please phone 08 899 6520 (Darwin) or 08 8951 5339 (Alice Springs) for more information. The Office of Adult Guardianship is another good starting point. For more information on how they can help please call 08 8922 7343 (Darwin) and 08 8951 6739 (Alice Springs). Centrelink has fact sheets and detailed publications about appointing a nominee to look after your Centrelink arrangements. The Department of Health has information about appointing a nominee to look after your arrangements if you live in residential aged care. 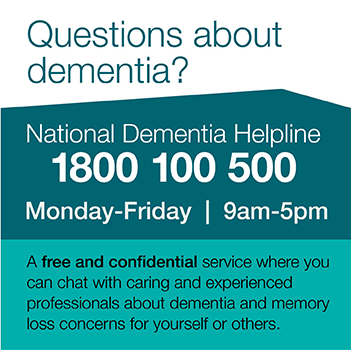 Phone the My Aged Care helpline on 1800 200 422. Advance Care Planning is a process enabling a patient, combined with end of life directives, to make decisions about his or her future health care in consultation with their health care providers, family members and other important people in their lives. An Advance Care Plan is one way of putting your plan into writing. The written Advance Care Plan helps you to accurately remember what you want and makes it easier to communicate these wishes to doctors and nurses who do not know you. For more information about how to make an Advance Care Plan see the Respecting Patient Choices website. Dementia will increasingly affect your ability to drive safely and may affect your insurance cover. You must tell the Department of Infrastructure, Planning and the Environment about you dementia. Phone 08 8999 5511 for more information. The Driving and Dementia help sheet may also be useful. You may notice that the effects of dementia begin to affect your work. If you wish to continue working, your employer generally has a legal responsibility to take reasonable steps to help you to keep working. If you own your own business or you are a director of the company, consider obligations that you must fulfil, such as keeping accurate accounting records and meeting your tax obligations. Symptoms of dementia may affect your ability to fulfil these obligations. See Making Employment Decisions for more information and Help Sheets. Northern Territory Legal Aid Commission can assist you with legal advice about your employment, or discrimination you may have experienced, as well as being able to assist if you are ever in trouble with the law. Phone 08 8999 3000 (Darwin) or 08 515377 (Alice Springs) or 1800 019 343 for the Toll free Telephone Information Service. The Human Rights and Equal Opportunity Commission has information about employment, disability and your rights. Some individuals may feel it necessary to remove the person with dementia from the electoral roll, especially when entering residential care. The Australian Electoral Commission (AEC) can provide steps on how to remove a person from the Commonwealth roll, by calling 13 23 26. See the relevant FAQ on the AEC website for more information. The Office of Adult Guardianship can give you information and advice about Adult Guardianship in the Northern Territory. Centrelink’s Financial Information Service (FIS) may also be useful to you at a further date. The Financial Information Service helps people to make informed decisions about investment and financial issues for current and future needs. FIS is free, independent and confidential. This service may be useful if you are confused about residential circumstances with Centrelink. You may also contact FIS by call 13 2300. Please contact us on 08 8948 5228 if you wish to comment on the information included on this page or know of useful resources which could be included.